Emmeline lives in a completely isolated settlement. She is a bold and independent heroine in a village that likes conformity and a strict following of the rules. I liked that she was willing to dig deeper in to the mysteries of the village when everyone was telling her not to. It was really Emmaline that made me enjoy the story and kept me reading. The love interests in Winterkill also kept me reading. I didn’t trust either of them. Kane was caring, flirty, and just a little mysterious. The reader is never really given a reason to distrust him but something about him never felt right to me. The love interest was village leader Gabriel who took a sudden interest in Emmaline when she turned sixteen. Because I didn’t trust either character I wasn’t invested in the romance and by the end it was obvious who Emmaline preferred, and for good reason! Winterkill was equal parts M. Night Shaymalan’s The Village and Arclight by Josin McQuein. 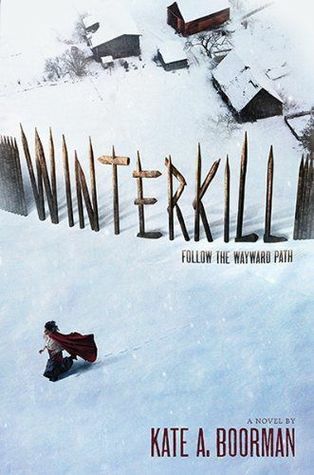 Winterkill though did make a valiant effort to set itself apart and I enjoyed discovering more about the settlement and its secrets. I would have enjoyed Winterkill more though had it not felt so similar to other stories. Overall, Winterkill was an engaging novel that kept me guessing, but it also left me with a lot of questions. Questions that were never really answered. At the time I’m writing this review there may be a sequel but it hasn’t been announced. I seriously hope there is a sequel though because even with Winterkills faults I thoroughly enjoyed this novel! It sounds like a great premise. I'm curious if I would feel the same way as you. I certainly do not like unanswered questions. Drives me nuts. Curious! !